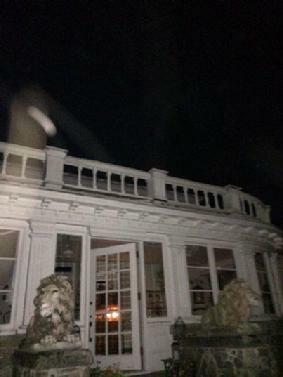 "The #HauntedHousewives had an AWESOME investigation last night at #FarnamManor in Richfield, OH. It is a beautiful living history museum, an absolutely amazing place.We believe we were communicating with the spirit of Everett Farnam and his daughter Emily. Great EVP's (mostly in the kitchen) and physical phenomena in one of the upstairs bedrooms." Schedule your visit to Farnam Manor now-dates are filling fast! Many resident spirits linger at Farnam Manor. Some spirits come and go. Little Emily Farnam drowned in the cystern here in 1858. It has been legend for over 100 years that Emily's spirit remains. Many have encountered Emily's playful spirit. Everett Farnam died in the upstairs bedroom in 1884. Mr. Kirk's cigar smoke can be smelled occasionally. Objects move,evp's,K-2's and EMF pumps go crazy. Many have reported hearing voices,giggling,footsteps or their favorite song playing. The Farnam experience is like no other. This is not an evil, ugly place, but rather a beautiful timeless backdrop filled with positive energy. The spirits love company, and you never know who you may encounter! Throughout it's history, Farnam Manor has been a place to gather and enjoy.Everett Farnam built this beautiful manor house for his bride in 1834.The Farnam's invited the community to many festive events held on the 3200 acre estate. During the roaring '20's, Ella Mayor operated an exclusive club for aristocrats. Patrons enjoyed fine wine, women and song. From 1948-1972, the manor was home of the Danish Smorgasbord Restaurant. People came from miles around for good food and laughter. After the restaurant closed, it became a popular party spot for the Richfield Colluseum concert goers. Experience the mysterious Farnam Manor, grounds, carriage house and the cemetary of Farnam graves! Week night investigations (Monday-Thursday) 8pm-5am $400 for up to 10 people, $40 each additional person. Get A Little Shut Eye Camping Package: Experience the spirits of the Farnam Estate 8pm-1:30pm the following day ! Bring your tent and camp on the grounds of the Farnam Estate! Don't have a tent? Rent one of ours! (additional fee) We provide evening refreshments with coffee, and water. Pastries and beverages in the morning.$600 for up to 10 people- $60 each additional person. Once you're here, you won't want to leave! Sit by the bonfire, camp out 2 nights,and enjoy 42 hours to investigate! This package includes Friday night refreshments,coffee and water. We supply Saturday night dinner feast, Saturday and Sunday morning coffee and pastries. $1000 for up to 10 people and $100 each additional person. Where else can you go to investigate where you get food, music and laughter, along with possible paranormal activity? It's all part of the Farnam hospitality!